Bike2Work 2008 Continues Friday, February 1! Ride Your Bike & Join Us for Free Breakfast 7:00-8:30 am! Come visit even if you aren’t riding, we are on the CARTA Free Shuttle. Latest figures show that 28.7 million Americans now telecommute. And these are not just with the hippest, coolest companies leading the way. No – one of the biggest users of telecommuters is the U.S. government. In the U.S Patent and Trademark Office alone, 3.609 employees participate in some form of telecommuting. USPTO Director Margaret Peterlin recently told Congress they will encourage more employees to telecommute. She said their experience shows teleworking results in “greater employee productivity, higher levels of sustained performance, reduced traffic congestion and air pollution, and reduced real estate costs.” She added that the USPTO employees who telework collectively save more than 613,000 gallons of gas per year and save more than $1.8 million annually in fuel costs. Sunday is usually reserved for a day off from everything and just chilling out. But on Saturday, I spent a good deal of time at the library and as such, was caught up on my reading. So when Sunday came and it was a very nice 55 degrees after church, I headed up the mountain for a quick climb. Strangely enough, this is the first time I have ever biked up Signal Mountain. It was a fun, quick ride only taking around 1.5 hours but I did abs afterward and felt rejuvenated afterwards. If anyone has any other book recommendations, please leave them in the comments section. A great article in Discover magazine that essentially explains that humans are actually more efficient runners than horses, or gazelles, or even cheetahs. While all of these animals are faster than we are, humans have evolved to be able to run for longer periods of time at slower speeds. We can run for days apparently. This made us good at running our food down even though it might have been faster than we were. Quite a bit of scientific evidence goes into this but even things like our spines come into play allowing our heads to counter balance the movement of our arms. And our skin is one huge cooling system supplementing our cardiovascular systems ability to shunt heat from our core to our skin via the blood while our sweat and air flow carries the heat away from our bodies. It is a really good article. 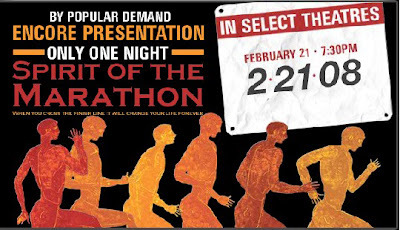 Spirit of the Marathon is being released tonight. Too bad it is not being shown in Chattanooga. It looks like a great movie. I am still happy I don't live in Memphis anymore! While the film was originally billed as a "one-day-only" movie premiere, a second, encore presentation -- scheduled for Feburary 21st at 7:30 pm -- has been added, due to popular demand. Tickets for this event will go on sale, starting tomorrow, January 25th, for this second showing. Click here, here and here to view the latest event details & theater/ticket information. 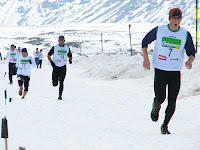 The Bend Bulletin ran an article this morning by reporter Mark Morical about winter triathlon. The story features tips from pro triathlete Matt Lieto and Nordic skier, Marshall Greene - both excellent competitors in the white stuff. Have a look here; it's a good read. For those not familiar with the sport, winter triathlon athletes compete in a cross-country skiing leg instead of hitting open water. Competitors race mountain and cyclocross bikes with, as Lieto puts it, "squishy" tires instead or road and TRI bikes. Nearly flat tires prevent the bike from slipping on snow, but don't try it on the road or you're destined for a flat! This is insane! I Love it! Anybody out there with any experience in this? Pretty soon people are going to think Martha Stewart is running this blog. I got this from USAT and thought everyone would enjoy some good warm carbs in these frigid temps we are getting. Spray pan(s) with nonstick cooking spray and set aside. Add egg product, canola oil, applesauce, water & pumpkin. Mix well with a wire whisk. Add craisins/raisins and nuts and mix just enough. Pour batter into prepared pan(s) and bake for approximately 50-60 minutes, check after 50 minutes. Bread is done when toothpick inserted in center comes out clean. 2. No salt stains on her hat or clothes. You can't run 26.2 miles and not have salt stains. Ask Rosie Ruiz. 3. The lone run-man theory. Katie Holmes was allegedly paced by this man, Wesley Okerson, who allegedly wore a racing bib that appeared to be recycled from the 2003 NYC Marathon (#6074) but appears to have a timing chip on his foot. Why the timing chip? Did he run with Katie's chip? Why the 2003 number? There's no official results for either Okerson or #6074. BTW, #6074 for the 2003 race was assigned to Al Finger. Alan Finger is a yoga guru to the the stars in Los Angeles. Coincidence? 4. The identical splits. Katie Holmes and another of her apparent trainers, Paul Vincent (#28994) recorded the exact same splits throughout the race. To do this, you'd have to choreograph your steps with the precision of the Radio City Rockettes. It's very odd. 5. No photos. The Kahuna has gotten a little obsessed with this. Photographers took wide angle pictures as runners across the 10k timing mat. The Kahuna looked up the photos of each runner who finished with a few seconds of Holmes' alleged 10K split (1:06:51), and couldn't find any photo that included Holmes on either side of the street. With her long pants, purple shirt and blue hat, she shouldn't be hard to spot. (On the Brightroom website, there are no photos of Holmes or Paul Vincent. Hmmmmm. 6. High heels. After struggling to allegedly complete her first marathon (5:29 and change), Katie Holmes put on a pair of high heels that night and attended the movie premiere with her husband, walking down the red carpet with no ill effects from the marathon. I would love to hear from my marathon friends in Korea on this! So most of you know I am one of the cheapest people on earth. Clif Bars and other are great and all but, $1 here, $2 there, gets expensive. I found this recipe from Alton Brown. Line the bottom of a 13 by 9-inch glass baking dish with parchment paper and lightly coat with canola oil. Set aside. Preheat the oven to 350 degrees F.
In a large mixing bowl, combine the protein powder, oat bran, wheat flour, wheat germ, and salt. Set aside. Coarsely chop the raisins, dried cherries, blueberries and apricots and place in a small bowl and set aside. In a third mixing bowl, whisk the tofu until smooth. Add the apple juice, brown sugar, eggs, and peanut butter, 1 at a time, and whisk to combine after each addition. Add this to the protein powder mixture and stir well to combine. Fold in the dried fruit. Spread evenly in the prepared baking dish and bake in the oven for 35 minutes or until the internal temperature reaches 205 degrees F. Remove from the oven and cool completely before cutting into squares. Cut into squares and store in an airtight container for up to a week. Please let me know if anyone out there has any other recipe's. My own savings isn't as impressive as I only commute 60 miles a week and have only been doing it for 2.5 years. However, every thing helps. If everyday practical bicycling had taken on political significance for you by the 1990s or earlier, in the US, chances are good you saw Ted White’s 1992 film Return of the Scorcher at a gathering of like-minded souls. It claimed the expression “critical mass” from nuclear physics for people riding bikes as part of traffic. It’s a yearning survey of the bicycling societies China and the Netherlands, both of which have powerfully shaped our own aspirations for reclamation of Portland from nearly a century of automotive disorientation. Please run for President Earl! The Wall Street Journal recently did this featurette on my US Representative Earl Bluemenauer. The Journal’s article has much more information on Mr. Bluemenauer and his cycling history. What can The Netherlands learn from us? Last summer, armed with a bike, a laptop and a perspective, Loek Hesemans came to visit Vancouver and Portland. As a Senior Policy Officer at the Ministry of Health in the Netherlands, he had come to see what the Dutch might learn from us in promoting cycling.. Yes, from us. If you are interested in cycling and commuting by bike - you will definitely find this information interesting. I got this from Team Louisville. Although I'm not a member of Endurance Nation this looks like a great deal. As many of you know I am training with the Endurance Nation team. I wanted to pass on a cool thing that they are putting together to get an "Epic Weekend" of training done over MLK weekend -- so this is just a cut and paste from their blog. You can go check it out yourself at http://www.endurancenation.blogspot.com/ or their site http://www.endurancenation.us/ The forum is pretty good too! Anyway, I signed up and I hope that some of you will too! Endurance Nation Announces FREE MLK Weekend Virtual Training Camp -- January 19-21, 2008. Challenge yourself, connect with fellow endurance athletes, and have FUN as we get together (online) for a virtual training weekend over the MLK holiday! Endurance Nation co-founders Rich Strauss and Patrick McCrann have created a challenging online schedule that you can modify to suit your personal fitness level. The coaches will begin the weekend with a Friday podcast to deliver guidance and tips, and present a live webinar on Saturday evening to cover epic training and how to use it to your advantage. The training will be Run+Bike workouts for Saturday and Sunday, with Run and optional Swim for Monday. All workouts can be adjusted for indoor or outdoor execution. Points will be awarded for execution and the awards will be many, including: Most Overall Mileage, Most Run Miles, Most Bike Miles, Most Creative Blog Entry, Best Weekend Race Report in the Race Report Forum, Best Workout Video, the list goes on. The Endurance Nation Virtual Training Camp is FREE and open to the public. Dupe your training partners into thrashing themselves with you!Register for the VTC by emailing us (virtualcamps@enationcamps.com) and we'll send you an Evite with the details of the weekend. Just RSVP and you're in! Endurance Nation is the brainchild of elite triathlon coaches Rich Strauss (Crucible Fitness) and Patrick McCrann (Performance Training Systems), who have combined communities, resources and training plans to create Endurance Nation. Endurance Nation is a growing community of 380+ triathletes educating and inspiring each other, managed within the framework of a consistent coaching and training philosophy. Members can take advantage of free coaching articles and high quality - yet affordable – coaching. The EN experience is augmented by our community platform, bringing experienced teachers to the desktop of every athlete. Finally, Endurance Nation will provide opportunities for the members to meet, learn from and train with the coaches and other members, through camps and clinics, an organized EN presence at national races, and other cool events. I took a different run home due to traffic issues and it was both challenging and rewarding as I got to see a lot of different scenery and was challenged by the new hills. It's also a little bit longer which I know will make me stronger. All of this said, my pace officially sucked! Owell, I was the only runner out there this morning in the nice 30 degree weather. For all of you folks in the Southeast there is a nice triathlon expo going on Saturday, December 26 in Nashville, TN. It's free and there are a lot of free goodies promised so I hope I can make it up there. One thing every triathlon has given me is humility. Although I love passing people in the swim with crazy expensive wet-suits, and pass people on bike's that costs well over 2x what my bike costs and passing people on the run the bottom line is that I only race against myself, which is a stark difference than most triathletes out there, including one of my main training partners Kevin. I encourage everyone out there to think about simply racing against yourself as a benchmark. Only you know what you are capable of. For me, I am capable of much more than I have produced at the triathlons I have competed in - and for that, at every finish I feel a bifurcation between my happiness/feeling of completion and between sadness/not training hard enough. In the end I am proud to call myself a triathlete. There is no other group of individuals out there with more generosity and great sportsmanship. Finally, it's also nice to see Adam Zucco, a triathlon coach with this humility on his blog citing his slow times when he first started and even fairly recent failures. Sometimes it dosn't pay to be the fastest! 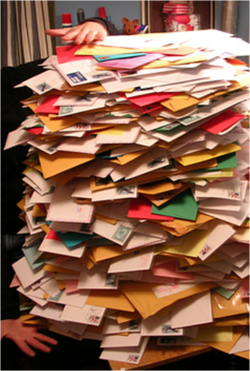 Church of the Customer received 21.5 lbs of junk mail during the month of December. In the comments, Graham does some math for us: 21.5 lbs of paper times an estimated 110 million U.S. households is approximately 1,056,000 tons of paper. If 8 trees are used to create a ton of typical (unrecycled) catalog paper, and 21.5 pounds is the average weight of unsolicited catalogs, then some 132,000 trees were used to send people junkmail during a one-month period. This morning I had my first brick workout. I didn't have a good light for my bike so I hopped on the trainer and succumbed to the horrible tv programing at 6:00 A.M. If there is anyone out there with embarrassing amounts of money and looking for a worthwhile cause - Please start an endurance tv channel! Interestingly enough the last mile of my run was faster than the last mile yesterday. Sorry Kenyans and training partner Kevin - I can't just go all-out in the beginning without crashing at the end. My pace today, was great and I was happy with the brick workout and the weather as it was a nice 59 degrees. As for other big news, I have joined Team Louisville 2008's blog so look out for my introduction which should be coming soon. I have officially started training for my Ironman with sore legs and a pounding heart every morning. I think this Nike + iPod thing is going to be my best and worst training partner as this morning I was really trying to pick-up the turnover and ended up with around the same time as last week. Owell, I will continue to do speedwork - hopefully at some point my time will start to improve. Jon Krakauer once wrote, "In any human endeavor, some fraction of its practitioners will be motivated to pursue that activity with such concentrated focus and unalloyed passion that it will consume them utterly... For some, the province of the extreme holds an allure that's irresistible... As a result of his or her infatuation, existence overflows with purpose. Ambiguity vanishes from the fanatic's worldview; a narcissistic sense of self assurance displaces all doubt. His perspective narrows until the last remnants of proportion are shed from his life. Through immoderation, he experiences something akin to rapture." This is pretty much what I looked like yesterday biking to work at 6:00 in the morning with a single-digit wind-chill factor! Today I chose to run and was only slightly dissapointed with my 8.3 min/miles. Fortunately or unfortunately, my wife bought me the new ipod + Nike for Christmas so there is no gratuitious rounding. Run when you can, walk when youhave to, crawl if you must; justnever give up.